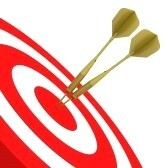 Today was exam day for the ‘Bulls Eye’ Sales training that I’ve had during the last months. The extra preparations done yesterday instead of partying paid of: I reached the ‘GOLD’ level! !